Europe’s ATV-4 cargo vehicle has undocked from the International Space Station (ISS) on Monday morning at 08:55 GMT, completing a flawless mission ahead of its destructive re-entry. 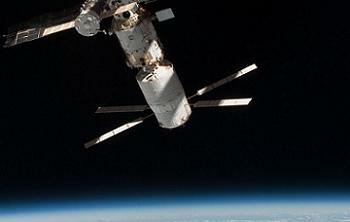 The vehicle provided the orbital outpost with a farewell gift, reboosting the Station’s altitude in its final act prior to undocking. The cargo vehicle was launched on its path to the ISS on June 5 via the Ariane 5 rocket from the from the Kourou Space Center in French Guyana. 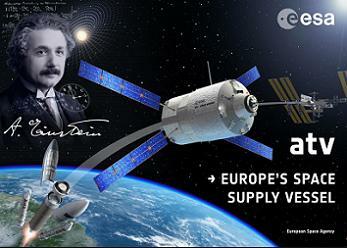 ATV-4 was the heaviest of the cargo vehicles for internal cargo, beating the upmass of ATV-3 in 2012 – which carried only 2,200kg of internal cargo, while ATV-2 in 2011 carried 1,605kg, and ATV-1 in 2008 only lofted 1,150kg. The vehicle – named after famed physicist “Albert Einstein” – was full to the brim with an internal cargo load, located inside the Integrated Cargo Carrier (ICC) portion of the vehicle, totalling 2,479kg of resupply items, spare parts, crew provisions, and scientific materials. As for fluid, or wet cargo, which is located in the Service Module (SM) portion of the vehicle, ATV-4 lofted 2,235kg of propellant for the ATV’s vessel itself, 2,580kg of propellant for ISS reboosts, 860kg of propellant to re-fuel the Russian Segment (RS) of the ISS, 100kg of gasses, and 565kg of water. Altogether ATV-4 carried 4,105kg of wet cargo, which is actually less than ATVs 3 and 2, which carried 4,395kg and 5,488kg of wet cargo, respectively. As a result, despite the fact that ATV-4 transported the largest ever load of dry cargo, the lesser amount of wet cargo meant that ATV-4 lofted less cargo in total than its predecessors, with ATV-4 weighing in at 6,584kg in total, whereas ATV-3 was 6,595kg, ATV-2 was 7,093kg, and ATV-1 was 4,557kg. Ten days after launch, ATV-4 docked with the SM Aft Port, in preparation for its unloading. All integrated operations proceeded to plan, including the re-loading of trash that will be burnt up with the vehicle during re-entry in November. “This mission has gone without a hitch and is an excellent performance by the operations team at the control centre and our industrial partners that built the machine,” noted ATV-4’s mission manager, Alberto Novelli. The vehicle – as per its design function – also performed a number of reboosts, allowing the Station to remain at its target altitudes during its race around the planet. One final reboost was conducted just days before its undocking. Following its undocking, ATV-4 conducted its pre-planned departure burns, ahead of one final mission objective – to bid farewell via a destructive re-entry. Under the guidance of the ATV Control Centre in Toulouse, France, ATV-4 will perform delicate maneuvers over the course of five days to position itself directly below the Station. Controllers will start the reentry procedure around midday on November 2, when ATV-4 is 120 km below the Station, which should allow the ISS crew to observe the craft from above as it disintegrates over the Pacific Ocean. This procedure will provide valuable information to calibrate future spacecraft reentries. In preparation for ATV’s impending demise, the first de-orbit maneuver, called DEO-1, will last nearly 14 minutes. 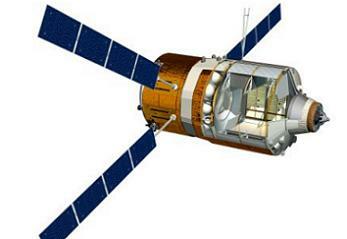 The second de-orbit maneuver, DEO-2 will involve another 15 minutes of thruster use. Following initiation of a tumble, ATV-4 will then gradually began to feel the increasing effects of Earth’s atmosphere, as temperatures rise, first ripping off the four X-shaped solar arrays, and then eventually rupturing the pressure vessel and propellant tanks, leading to vehicle disintegration. Any surviving debris from re-entry impacted the Pacific Ocean, thus concluding the highly successful ATV-3 mission. Aboard the ATV-4 during re-entry will be the Re Entry Breakup Recorder (REBR), a spacecraft “black box” designed to gather data on vehicle disintegration during re-entry in order to improve future spacecraft re-entry models. A REBR successfully took data during the re-entries of Japan’s HTV death plunges. However the REBR aboard the ATVs have suffered from problems in the past, such as ATV-2’s re-entry, which resulted in no data from the REBR. This was suspected to be related to the fact that the ATV-2 REBR was bolted to the ATV structure itself, as opposed to being strapped down as it was on HTV. Plus, the large propellant tanks on the ATV may have exploded, damaging the REBR. To mitigate this, future REBRs have been located further forward of the propellant tanks and secured only with straps, which appears to have worked since it has been confirmed that the ATV-3 REBR did successfully take data during re-entry. 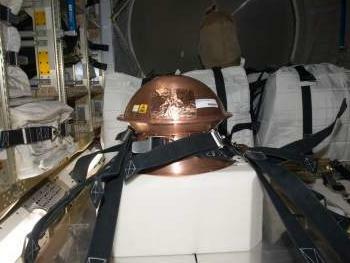 ATV-4’s unique re-entry plan should result in both data and visual observations from the ISS. “To close the mission with such a delicate but spectacular operation is a fitting end to all the hard work of the people involved,” added Jean-Michel Bois, heading the operations team at the control centre.